The US is the wealthiest country on the planet, and Mark Dynarski wants to implicate teachers for low test scores. Mark Dynarski gets it wrong with teacher evaluation (Brookings, Dec. 8, 2016). Mark Dynarski does not understand assessment: "The crucial question is whether students are learning. To answer that, we need some measure of learning: a test." Tests do not measure student learning. Tests measure a student's ability, or choice, to achieve high test scores. Alternatively, students benefit from assessments that are designed to help them show what they have learned, from their own perspective. Crafty educators can use data, both qualitative and quantitative, from student-driven assessments to adjust instructional strategies to meet students' needs. The author does not understand science: "Teacher evaluation systems need a stronger scientific basis." Quantitative data from high stakes standardized tests does not constitute "science." Science would consider a systemic, holistic approach, and then isolate variables. And there are at least as many variables in a classroom as there are students. Individual students are too varied to prove (or disprove) a teacher's effectiveness. Trends or patterns within one classroom with 25 students -- or across several classrooms with 150 students -- in the same year, or over several years, SHOULD vary based on students' interests and needs, and the extent to which a teacher is supported by her/his school. There are also too many variables before, during, and after school to link teacher effectiveness with "objective" test scores. Perhaps the author does not understand inequity: "We need a more solid research and measurement foundation about what aspects of teaching improve learning." When children arrive at school well-rested, well-fed, and feeling safe and curious, well-supported teachers can do wonders. Teachers are life-long learners, and we can always enrich our curricular, instructional, and assessment strategies. Fair-enough. However, students who are proximate to the violence of poverty exhibit enormous amounts of stress that they bring to schools. These students need equity, i.e. unique in-school services that can help them want to do well in school. And it would be really helpful if our society acted to address the upstream source of poverty, i.e. income inequality. 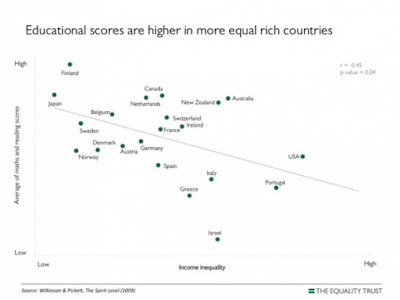 Data from The Spirit Level shows that even wealthy American children also suffer from the fallout of an unhealthy society. 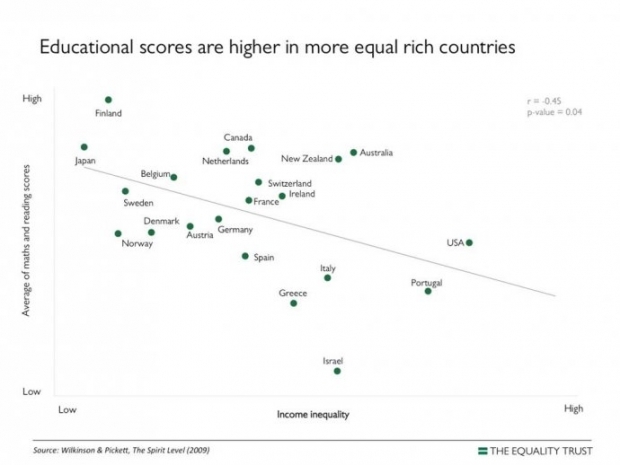 Among the wealthiest 23 countries on the planet, those with the biggest income inequality (i.e. the U.S.) have the highest rates of depression, mental illness, teen pregnancy, incarceration rates, drug abuse, obesity, and violence, and low educational "achievement" rates (see Fig. 1 below). The author does not understand pedagogy: "We are spending billions to little effect because we do not know enough about what we are looking for." If these outcomes come close to what we are looking for within the profession, then we should ask teachers to design their own professional learning plans so that they become more effective at realizing such aims. If students come to school and aren't ready to learn, then we need to support students and educators by creating and sustaining equitable in-school conditions. Focusing on education as a means to redress poverty will help to a point: but it will not address the source of inequities, i.e. income inequality. Therefore, we need to support students and educators by creating and sustaining equitable out-of-school conditions. The author has a point: "We need a more solid research and measurement foundation about what aspects of teaching improve learning." We need hybrid teaching roles so that more teachers can conduct meaningful research and advocate for effective systemic strategies that promote student engagement.